This article is guest blogged by Fabien Ngô (Ph.D.), a sprint coach in Brussels and Montreal coaching primarily teenagers and masters age groups. As well, he did an Interview with Pierre-Jean Vazel which is a must-read. 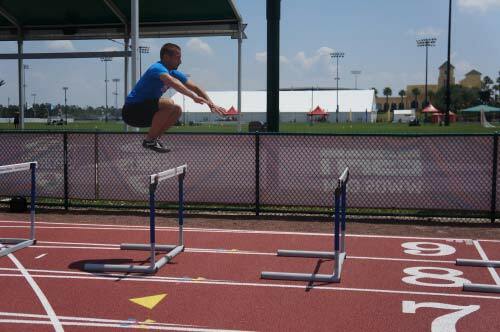 Be sure to read Part 1 of Hurdle Hops and Extended Bounding first. Rudiments or remedial bounds (see “Pluto series” in Boo’s Training Inventory in the Info Box below): start with the two leg bounds mentioned in the hurdle hops tutorial, then progress to single leg bounds, also in the “Pluto” series. In the beginning, the athlete performs very low amplitude bounds and keep the free leg in front of the center of mass in a dorsiflexion position. This allows proper posture of the pelvis and teaches a good foot position for the latter stage of the progression. Of course, flat foot contact should be used to dissipate impact properly. The same progression of singles, doubles, triples and continuous bounding is used for unilateral bounding. 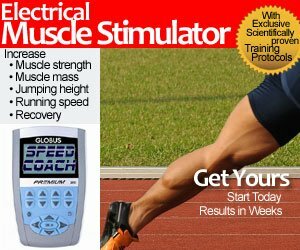 Click here for more information on Coach Schexnayder‘s demonstrations of his entire training inventory including the names and demonstrations of over 40 circuits and over 400 exercises, organized by category, intensity, and circuit. Also includes specific Warmup Routines, Static & Dynamic Flexibility Routines, Sprint Drills, Hurdle Skill & Mobility Circuits, all Plyometric and Multi-jump exercises. Or, check out the full Boo Schexdayder Jumps 5-DVD program. One can then progress to slightly higher amplitude bounds. By amplitude, we mean vertical displacement. A cyclical free leg movement is taught. Usually, the position of the free leg taught previously will automatically evolve to a nice free leg swing but some athletes may try to exaggerate the swing. If done correctly the free leg will almost touch the ground. Meanwhile, you can also use skip for height and distance and run-run-jumps while focusing on the same technical aspects. At that point, you can start to put wicket and increase the distance. The wicket serves as a guide the same way the hurdles do for the hurdle hops. Vertical displacement of the center of mass should be present to ensure proper posture and limb repositioning. At no time, the athletes try to forcefully raise his knee. Also the shorter the bound, the lower the knee. Recovery mechanics should be a reflex. To know if your athlete is ready to progress to a larger spacing (s)he should look robust on the ground while staying relaxed. By robust I mean that they should exhibit very good stabilization at impact. As they progress a slight wobbling will be present. That’s fine since it’s a new exercise. The wobbling *will* disappear as the athlete master the new distance between the wickets . Skip, scissor bounds, run run jump and gallop are usually less intense than alternate, double double and triple triple. They should be considered first and can be done on longer distances. Concerning arm movement double or single arm can be used. Gallop is a great way to teach double arm movement. 1 X (30-40) : gallop, run-run jump, skip for distance. How do these sessions can fit into your program? Extended bounds can start at the end of the specific preparation phase and beginning of competitive phase. Like strength endurance or speed endurance before you can endure a quality you need to have it in the first place.